Omega and fish oils supplements and pills are increasingly popular, and it may be even one of the most commonly taken supplements in the world - it may even belong to the category of "superfoods". Plus, there have been quite a number of research and studies that demonstrates that a good fish oil supplement is very beneficial and directly effective for your health. What Are The Best Fish Oil Pills & Its Benefits? Xtend-Life, a New Zealand-based natural health supplement company, came into the world of online supplements in 2000 with its flagship Total Balance product line. Since then, they have expanded into the profitable and popular fish oil supplement market as well. Fish oil pills, as long as they are properly prepared (also known as sourced and molecularly distilled), have impressive health benefits, and are similar to the superfoods groups like cayenne, turmeric, bee pollen, ginseng, goji berries and ginger. 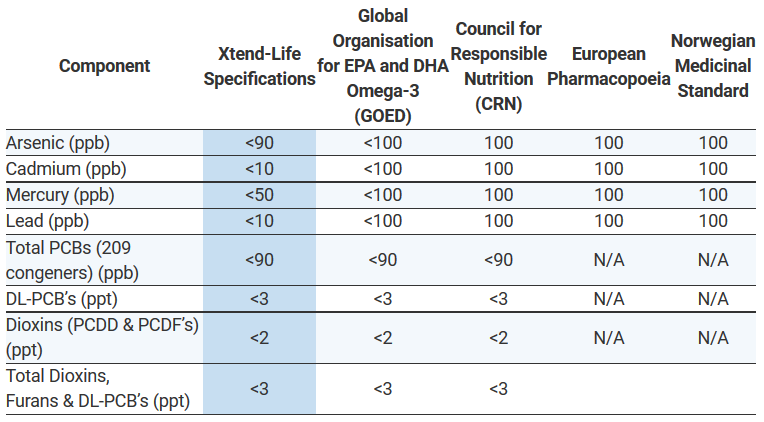 The table below compares fish oil purity standards, and one can see that Xtend-Life fish oil standards exceed the standards as established by various international organizations seeking to properly regulate fish oil supplements. 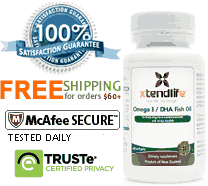 Additionally, to show even more evidence as to the purity of their fish oil supplement line, Xtend-Life produces a Certificate of Analysis (COA) each label for each bottle of their Omega 3 DHA Fish Oil. Xtend-Life says that this confirms the potency and purity of each batch of raw nutrients that comprise the fish oil gels or supplement. The other nutrients that are added, such as lycopene and astaxanthin, are additional key ingredients. Lycopene offers many clinically documented benefits including helping prevent atherosclerosis (a high causal risk factor in heart disease), prostate cancer and asthma. Astaxanthin, on the other hand, is a powerful antioxidant. All of these ingredients in their product meet pharmaceutical-grade quality as they are tested, validated, and created in cGMP-compliant facilities. The fish oil is not added to the other ingredients until it’s completely molecularly distilled. This ensures that the oil is purified and free of any unwanted contaminants. I'd like to highlight that this is not common practice and it’s a very expensive practice, which is why many manufacturers don’t do this. The ingredients are then formulated into the soft gels needed for fish oil and bottled in Xtend-Life’s own cGMP-compliant facilities. This GMP compliance is the highest purity and quality standard possible. It’s very fair to say that the Xtend-Life company takes quality and purity very seriously. Are These The Best Fish Oil Pills Available? Let's cover the core ingredients in this product. Xtend-Life says that all their fish oil are extracted from tuna and New Zealand hoki fish, which is a fish endemic to the pristine ocean waters of New Zealand, and their waters are considered to be among the most pure and contaminant free in the world (geographically, New Zealand is located near south pole, with very little industrialization from south pole to contaminate their air and waters). The last two ingredients are what distinguish it from their basic Omega3 / DHA Fish Oil product. Their fish oil supplement version is very popular and it sells very well. Many customers are very happy with outcomes from taking the omega 3 from Xtend-Life. I have been truly impressed with my last pack of Omega 3 Premium I ordered. I can honestly say that I feel my memory has improved!! Thanks. Through my experience with your skincare range [of products], I decided to give the supplements a go and consulted with Jo Machin for assistance as I have had multiple ongoing health issues since 18 [years of age]. I suffer from Carcinoid Syndrome (corrected through surgery), HIV+ (18 years+), 6 x Heart By-pass (atheroschlerosis), Kidney Transplant. One month ago I started on Omega 3 Premium, Total Balance (the men’s option), Cardio-Support [used to be called Cardio-Klenz] and within two weeks the swelling in my ankles has completely disappeared as has most of the inflammatory complaints that I suffered. I feel so much more energized and have commenced an light weight exercise routine at the gym and swimming again, I have not done this for about 10 years due to feeling constantly ill. I keep my doctors informed about what I am taking in addition to their medications and have yet to have some follow-up blood work done to confirm improvement in blood pressure and blood count etc. I feel so much better and look forward to ongoing improvement as the months/years go by, thanks for your innovative and cutting-edge products. Really great fish oil product. I’ve tried a few and this one is the best. I also like the fact that it’s affordable. It gives a lot of bang for the buck in terns of health benefits. I like that. While I think with some of the other Xtend-Life products are too highly priced, I also understand that as the product meets strict GMP requirements and that assures me I’m getting a great, quality product. I also take cayenne, ginseng and turmeric for supplement reasons. This, though, is my staple. I like Total Balance when I can afford it but I definitely like your fish oil stuff. Omega 3 DHA Fish Oil sells for $17.95 USD per bottle, which is a very good price. In each bottle, you get 60 soft gels. Xtend-Life recommends to take 2 soft gels per day, so that means one bottle will last you for 30 days. Xtend-Life offers a full one-year (365 days) guarantee from date of purchase. If you are not happy with the product in anyway, return the unused portion or bottle and you can either get a full replacement or your money back within 365 days - it’s your choice. This is one of the best guarantees in the world for the supplement industry, and for online supplements in general. Are There Any Customer Complaints About Xtend-Life’s Fish Oil Pills? To be honest, there are not a lot of negatives or complaints about this product. In fact, the three fish oil products offered by Xtend-Life sell well and they appear to have a lot of satisfied customers. The dreaded smells associated with the dreaded fish burps is now minimized now with this product. It seems that once the body’s digestion processes acclimate to it, the burps go away (my experience). Where Can I Buy Xtend-Life Omega 3 Premium Fish Oil For Mood, Heart, Cholesterol And Sleep supplements? I hope that this review of the Xtend-Life Omega 3 Premium Fish Oil For Mood, Heart, Cholesterol And Sleep Review supplement product was helpful, and that it will help you in selecting a fish oil supplement.